Comprehensive Dentistry Builds From The Foundation Up! Comprehensive Dentistry Builds From The Foundation, Up! Many people only seek a dentist as a last resort, when the discomfort has beyond irritating to unbearable. They feel that they can save money by just having the dentist fix what is broken. But this single tooth approach to dentistry is actually short-sighted and hurts you in the long run. Why? Because fixing something always costs more than maintaining it. Comprehensive dentistry is a lot like remodeling a house. You must start from the foundation up. Once a strong foundation is made, you call in a designer to put on the finishing touches. Comprehensive dentistry starts with services such as hygiene, crowns, implants, root canals TMJ and then moves on to the “finishing touch” services such as teeth whitening, bonding, and Invisalign. 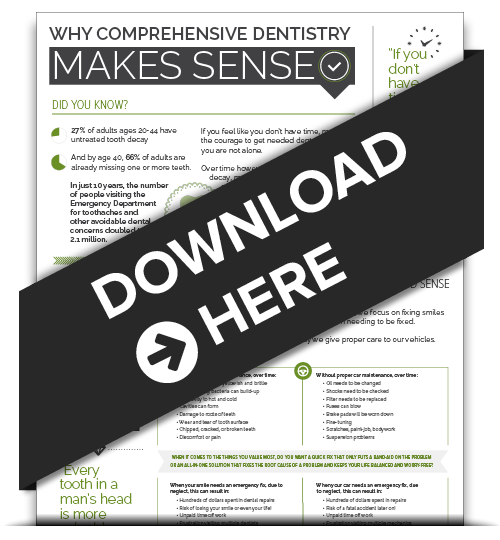 How does comprehensive dentistry save you time and money? →How maintaining your oral health is like maintaining your car. →The 4 ways you will see real benefits. Download it today and you can be reaping the benefits tomorrow! While all of us want to save time and money, the best reason for choosing comprehensive dentistry is your health. Would you be surprised to learn that some very serious health conditions have been linked with poor oral care? Heart disease, diabetes, and arthritis are just a few. Bacteria can enter the body’s bloodstream through damaged teeth and gums. This bacterial inflammation can wreck havoc on the rest of your body. It’s been said that your oral health is the gateway to your whole-body health, and the facts back that up. Being proactive, and maintaining good oral health is a key to keeping your whole body in the best health possible! We hope we’ve given some things to think about when it comes to your oral care. We would love to discuss the benefits of Comprehensive Dentistry with you on a one-to-one basis. We invite you to call our Seattle office at (206) 420-3836 or contact us online to make an appointment. And don’t forget to get your free download!